The less we reveal about We Need to Talk about Kevin, the better your experience – but it certainly won’t make it any more accessible. Our account begins with a disheveled woman emerging from a run-down house defaced with red paint splattered all over it. We discover the woman’s car has also been vandalized as well. She drives to a travel agency in a strip mall to apply for a job, which she obtains. She currently lives alone but we flashback to a time when she was married with two kids, a son and a younger daughter. Actually the chronology jumps around from past to present frequently in a haphazard fashion. The non linear storytelling often seems more like a stylistic device than one conducive to coherent storytelling. Yet the events are spellbinding as they attempt to illustrate the root of evil. It’s a singular performance that makes the picture. Tilda Swinton is mesmerizing as a successful travel writer, now mother. As Eva Khatchadourian, she conveys a woman who must juggle marriage, career, parenthood and her family, some with more interest than others. The script indirectly suggests that her ambitions have consequences. John C. Reilly is frustratingly naive as her husband, Franklin. At least he’s capable at portraying a loving father. Nonetheless, Swinton and Reilly never make any sense as a couple and how these two could possibly fall in love and get married, constantly nagged at me. Actors Jasper Newell and Ezra Miller are extremely unsettling representing their son as a youngster and later teen, respectively. 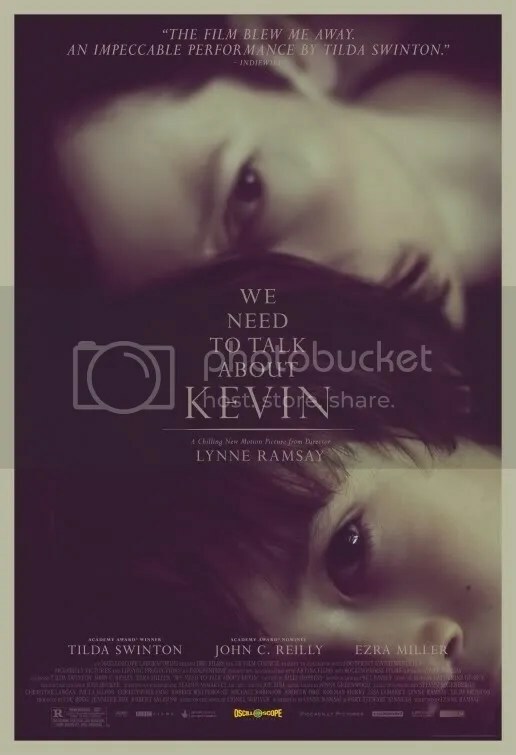 Kevin’s tense relationship with his mother is the core of the narrative, but it’s not the ultimate drive of the picture. Make no mistake, this is Tilda Swinton’s show. She seizes focus in every moment she is onscreen. Her portrayal resonates even more after the movie is over. Tilda is such a unique talent, I doubt any other actress could have pulled off what she accomplishes here. Scottish director Lynne Ramsey has fashioned a stylishly made film from Lionel Shriver’s 2003 novel of the same name. While the words of Eva’s letters written to her husband were so important in the novel, it is the subtle auditory and visual clues that the viewer must assemble to explain the reasons “why” of the story here. Notice the way Eva sits in her hospital bed after giving birth as her husband holds their newborn or Kevin’s piercing cry while being held by mommy Eva in a later scene. The color red appears throughout: Spain’s La Tomatina festival, graffiti on her home, the blinking numbers on an alarm clock, the rubber ball she tosses to her son, the wall of tomato soup cans behind her at the supermarket. The shade appears again and again and the effect is seductive in its hue. One major quibble, however, is the odd choice of songs, particularly Lonnie Donegan’s skiffle and Texas singer Washington Phillips’ gospel, which are totally inappropriate for the mood. This is a study of the very nature of evil. A dissertation, if you will, on the factors that develop the personality of a human being. Can someone be born bad or is it learned? At the center is Tilda Swinton’s performance. We feel sympathy, then outrage. At times we want to rebuke her but then we forgive her. The justification for these emotions is often brutally vague, even to ourselves. Yes, director Lynne Ramsey raises more questions than she answers, but that’s the point. This is a drama ripe for discussion without clear cut solutions. She presents an interesting argument. The subject is sure to provoke a reaction and it’s definitely one worth “talking about”. This entry was posted on January 25, 2012 at 8:00 pm and is filed under Drama, Thriller with tags 2012. You can follow any responses to this entry through the RSS 2.0 feed. You can leave a response, or trackback from your own site. “ripe for discussion without clear cut solutions”. I completely agree with that sentence. I’d rather have a clear cut solution. I didn’t really connect with anyone but was intrigued. Wish It was more believable. Didn’t buy into this. I liked what the script had to say about the parent’s role. I didn’t necessarily agree, but I thought the idea was interesting. Nice review, Mark! Agree with you, especially on the expressiveness of the color red and the odd soundtrack. Tilda Swinton shined and so did Ezra Miller (with siginificantly less screen time). I also couldn’t buy John C. Reilly and Tilda as a couple. The worst thing I usually say about a soundtrack is that I didn’t notice it. This one was thoroughly irritating. The songs had titles that fit the scene, but were stylistically all wrong for the picture. I had to dock half a star for the music. On a scale of 1 to 10, how bizarre is this movie? Right now, it’s sounds like a 7 for me (I haven’t seen it, and I doubt that I will even understand it if I do), and everything I read about it just makes that number meander around the 6 to 9 range. How bizarre on a scale from 1 to 10? Maybe a 5. It’s a pyschological drama with horror elements. It’s more disturbing than anything. All right. I don’t usually enjoy psychological dramas. I’ll pass. Hey Mark! Reading your review actually makes me want to re-watch this movie! Great review! I love the fact you described it as study on evil and raised the question of whether or not that this is learned or innate. I don’t remember enjoying this movie per se, but I did find it interesting, and I’m not sure I wrapped my head around the symbolism of the colour red…I don’t remember having an averse reaction to the soundtrack though. Agreed, John C Reilly was the weakest link – I’m not sure if that was due to his performance or whether he was badly scripted. The UK hasn’t suffered high school massacres to anywhere near the same scale as the US, so I’m really interested to know what the general reaction was to the climactic scene. Now that you’ve witnessed her performance, do you understand my grievance that Tilda Swinton wasn’t nominated for an Oscar??? Always a pleasure reading your reviews! I take the fact you wanted to see it again because of my review a compliment of the highest order, so thank you for that! Don’t get me wrong. I think John C. Reilly is a great great actor. I just feel he was miscast as a husband to Eva, Tilda Swinton’s character. I mean even on paper that combination is a bit odd. It seems as though Tilda should have been nominated. I like her more than Michele Williams and Rooney Mara and I suspect I would like her more than Glenn Close, though I haven’t seen Albert Nobbs yet so not a fair appraisal. The others, however, deserve to be nominated. Meryl and Viola were extraordinary as well. Thanks for commenting. I really appreciate your views! Tilda was definitely snubbed and so was Elizabeth Olsen. And Mia Wasikowska! I’m glad Rooney Mara’s fearless ‘Lisbeth’ deserved the nod. I just watched ‘Albert Nobbs’ last night and wasn’t thoroughly impressed with Close’s work. I think she’s the one that doesn’t belong. “We need to talk about Kevin” isn’t exactly the easiest film to surmise or even watch for that matter. One is left a bit voided?! I use the word “voided”, because I can’t seem to think of a more appropriate term for my lack of ….? So it seems to fit.? Which is why I really love your review for this film. You were able to find to. I did actually enjoy, well maybe not enjoy, but appreciated this film; for it’s acting, direction(& misdirection) & truly compelling story. I’m a long time Tilda Swinton fan & she never fails to impress me with her subtlety, that hits like a punch. She really knows the difference between being a loved character who is sympathized with & a fleshed out (believable) person you empathize with. I don’t know who I would recommend this movie to, but I would nonetheless. I knew you would appreciate the film. You sound more hesitant in your praise than I expected. Knowing your love for Tilda, I kind of presumed you to proclaim this as the best film of 2011. I guess that’s expecting a lot. Nevertheless, I was really looking forward to your thoughts about this film. Thanks for commenting. I usually try to know as little as I can about a movie before I see it, but a colleague already told me what it was about. It really didn’t change my enjoyment (if that’s the right word) of it. It was an excellent performance by Swinton and a movie which really managed to get under your skin. Yes, Tilda was memorable and the perfect choice to play this part. I’m still haunted by this film. The acting is what holds this movie together. Tilda is superb as always but Ezra Miller is just phenomenal as Kevin. He has come a long way since We Need to Talk About Kevin to Perks of Being A Wallflower. Have you watched Micheal Clayton ? Tilda was at her best in that flick. Yes I’ve seen Michael Clayton. She won the Academy Award for that in a supposedly very close race. I remember Ruby Dee was mentioned more for American Gangster as well as Amy Ryan for Gone Baby Gone. Tilda’s win was a bit of an upset.